Kaltreider, RC, AM. Davis, JP Lariviere, and JW Hamilton 2001. Arsenic Alters the Function of the Glucocorticoid Receptor as a Transcription Factor. Environmental Health Perspectives 109:245-251. Kaltreider et al. demonstrate that, at extremely low levels of exposure—levels far too low to call cell damage or 'traditional' toxicity—arsenic alters hormonal function in the glucocorticoid system. The metal interferes with glucocortoid signaling necessary to turning on genes involved in tumor suppression and other activities. By preventing these genes from turning on, arsenic may increase the risks of cancer. This new result may require radical strengthening of arsenic exposure standards, because it takes place at levels far beneath current safety thresholds. The glucocorticoid system is centrally involved in a wide range of physiological processes, ranging from the control of growth to glucose regulation and protein metabolism [More...]. By implication, disrupting the glucocorticoid system can have profoundly negative impacts on development and health. Dysfunction in the glucocorticoid system has been linked to weight gain/loss, protein wasting, immunosuppression, insulin resistance (which can lead to diabetes), osteoporosis, growth retardation, and hypertension and hypertension. "the doses that we're using in cell culture that cause these endocrine-like effects are well below any levels that caused any signs of toxicity in the cells. In fact, we were down in what's called the nanomole range, or parts per trillion, and still seeing these effects. Now, if you look at what people are exposed to, it suggests to us that we could see these endocrine effects quite reasonably, probably, at the levels that people are exposed to here in the U.S."
Kaltreider et al. speculate that this low level endocrine disruption may be involved in links between chronic exposure to low amounts of arsenic and several human diseases, including cancer and diabetes. "Arsenic-induced alterations in GR function may play an important role in the mechanism of arsenic carcinogenesis. ... GR has been suggested to play a fundamental role in carcinogenesis in both lung and skin in experimental animal models. " Glucocorticoids are known to suppress tumor growth. It may be that arsenic suppression of glucocorticoid activity reduces the effectiveness of glucocorticoid tumor suppression. 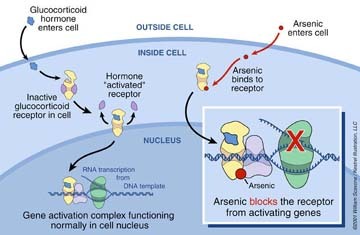 "Thus, if environmentally relevant doses of arsenic are able to suppress the normal function of GR as a mediator of gene regulation, as suggested by our results, we hypothesize that this may contribute to its ability to promote tumorigenesis and contribute to other pathophysiological states in these tissues. This unique mechanism would suggest further that arsenic may be able to act synergistically with other toxic and carcinogenic agents to increase disease risk, which is supported by epidemiological data that indicate a synergistic increase from cigarette smoking and exposure to arsenic. Because arsenic contamination of drinking water is widespread in the United States and elsewhere, and it is usually found in combination with many other toxic chemicals at most Superfund and other toxic waste sites, these combined exposures may represent a significant human health risk. " Their findings should stimulate the US EPA to lower exposure standards to arsenic. EPA had developed new standards in the final days of the Clinton Administration, decreasing them from 50 ppb to 10 ppb, but in March 2001 the Bush Administration announced it was withdrawing them because, according to Administrator Christie Todd Whitman, "the science is squishy." Given the 1999 conclusion by the National Academy of Sciences that the old standards "could easily result" in a 1 in 100 risk of cancer to people drinking arsenic-contaminated water, Whitman's assertion is ludicrous. The Academy is habitually extremely conservative on all matters chemical, yet concluded that the old standards were inadequate. The New York Times reported (21 March 2001) that Whitman's decision reflected intense political pressure from mining interests, whose operating costs would rise if the new standards were enforced. The Times also observed that mining companies were significant financial contributors to the Bush 2000 presidential campaign. What is unique (to date) about the mechanism discovered by Kaltreider et al. is that arsenic's disruption of the glucocorticoid system takes place after the hormone-receptor complex enters the nucleus. Inside the nucleus, arsenic interferes with the way that the glucocorticoid-receptor complex activates genes. Most hormone disruptors act by (1) affecting the amount of hormone (either by increasing/decreasing hormone synthesis or increasing/decreasing hormone metabolism) or (2) by interfering with the binding of the hormone with its receptor. In contrast, Kaltreider et al. found no indication that arsenic intefered with hormone-receptor binding or entry of the complex into the nucleus. Their data indicate that changes in the system instead took place within the nucleus and involved selective inhibition of DNA transcription that normally would have been stimulated by the glucocorticoid-GR complex. The detailed mechanisms of the interference are not yet known. Glucocorticoid disruption by PCBs has already been documented, and appears to work because PCBs interfere with glucocorticoid-receptor binding. This PCB effect may underlie the ability of PCBs to affect immune system function.